Mod will help you to have better results in the battle. As you know there are unpleasant situations when the circle of information converged but desired results from shooting did not happen. What is the reason of such situation? For successful results is necessary not only converged information circle but also to server scope. The information circle shows the status of gunner and server scope – the projectile flight. The dispersion circle and scatter converge at different time. 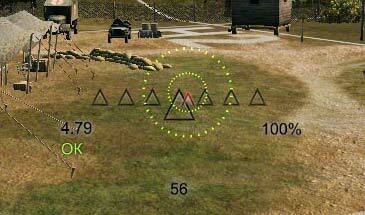 The server sight in the game is absent so player can not check whether his shot will hit exactly at the enemy. To facilitate the task and effectiveness of the battle, modders made mod in which you can use client sight and server scope togather. When server and client scatters converge – your shot will be right on target. Author of mod is StranikS_Scan.